YAY! More delicious food! Some repeats and some new! I have to say I like how it isn’t the same veggies each week. Or a box full of 3 heads of cabbage and 15 green and red peppers! I love the variety, the colors and the flavors! Ah! As I said a few weeks ago… it’s about as good as Christmas each week! And I don’t have gifts to buy and wrap! I just get a HUGE gift each week! This week upon opening the box it was FULL of beautiful colors! In the past few weeks it’s been a LOT of green! 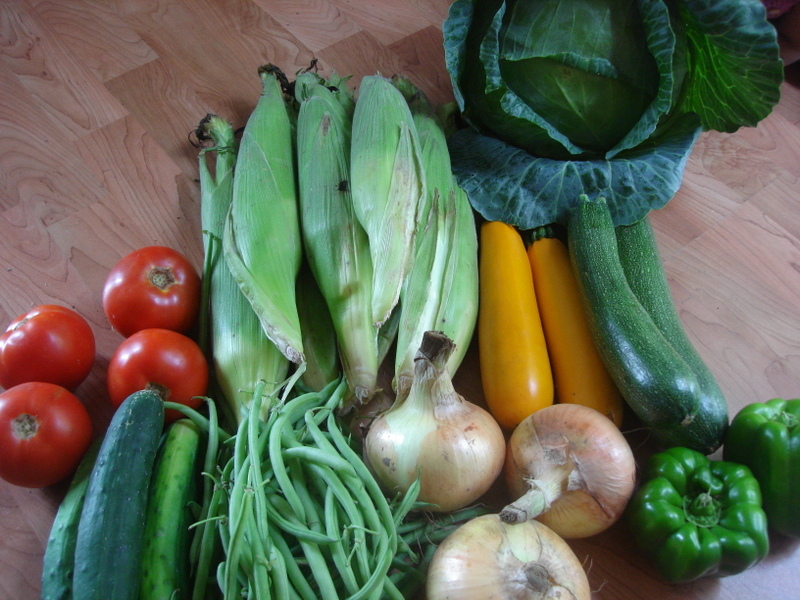 Not that I’m complaining, but I’m happy to see the summer veggies are starting to roll in! AND this week we received some lovely flowers! 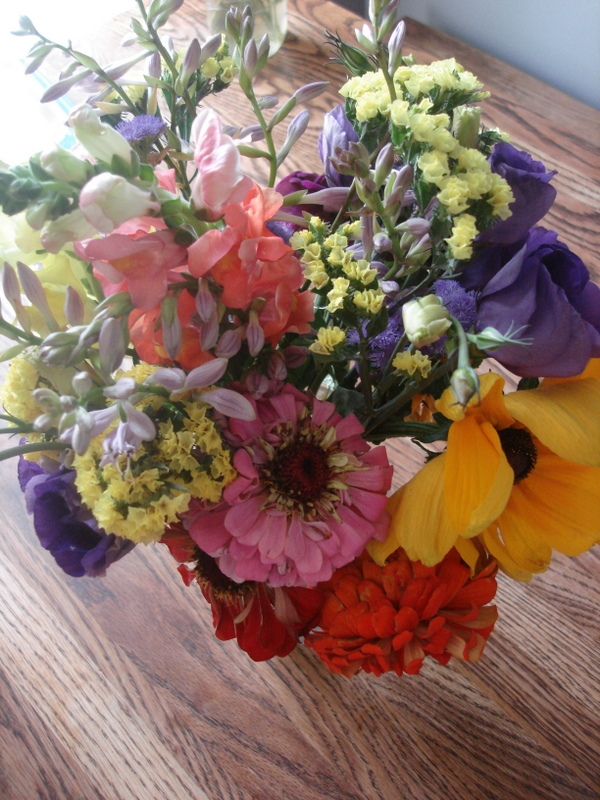 I just love fresh flowers on the kitchen table! Each time I walk through the kitchen and see the cheery bunch it makes me smile! Here is our list of amazing veggies!!! Tomatos: There is NOTHING like a farm fresh vine ripened tomato! It is a whole different fruit than what is found in the grocery store! Two nights ago we had them sliced with basil leaves on top and sprinkled with a little balsamic vinegar. The boys were counting them and dividing them to make sure we each got equal amounts… I guess they liked them! They would have been even better with sheep’s feta, but alas, I didn’t have any! Last night we had taco salad with fresh onions and tomatoes on top! Oh so delish! Onions: Again, most of us don’t need any instruction on this! I did make liver and onions last week and used these onions! The onions were perfectly caramelized and added some dried figs to add some sweet to the liver! Mmmm… I did overcook the liver though, so it could have been better. Brian said he would cook the liver the next time… So I guess it was a lot overcooked… oops! But he liked the onions! Can’t remember if I’ve mentioned this recipe before or not, but Sausage Spinach Quiche is one of our favorites around here. It will use some onions for sure and you can also used some spinach or other greens from the past few weeks as well! It’s quick and simple and very tasty! It can be had for breakfast, lunch or a light dinner! Green Beans: This is one of my kiddos favorite veggies. When at the grocery they often ask for broccoli or green beans! Recently the preferred way to eat them is lightly sauteed with lemon, mustard and almonds. I know it sounds a bit odd, but it really is good! You should give it a try! Cabbage: Wow! Another cabbage! To be honest, I still have one in the fridge! I really need to get moving on an EXTRA large batch of fermented sauerkraut. We really do like it A LOT and a tasty reubin sandwich is calling my name loud and clear. That is one food that always makes my mouth water and I’m always in the mood for! One thing I really like about making a large batch of sauerkraut is that I can get the kids to help pound it in a large bucket. I’s a game to them and I get work done! Perfect! Yellow squash: I’m not a huge fan of squash and zucchini. And I think I’ve mentioned that before, but that’s probably because it is still just as true now as it was last week and the week before! Tonight for dinner I’m actually planning on making squash noodles and serving pesto over it. I’ve done it before with zucchini and it’s worked well, so I’m hoping for the same with the squash! I usually use the mandolin to cut it in strips like spaghetti and then blanch for literally a few seconds and serve! It’s SO SO SO easy! Easier than pasta! I’ll let you know how it turns out! Zucchini: All ready this afternoon I used the mandolin and sliced both of my zucchini’s paper thin and sprinkled with salt and dehydrated. They are like chips in a few hours and so so good! The kids LOVE them for snacks and they couldn’t want anything healthier! They are crispy at first and then melt in your mouth! They kinda remind me of the baby puffs that melt so they can’t choke on them! Even baby Xanthie likes them and it’s perfect for her! Cucumbers: Another favorite veggie around here! Good in the salad I’ve posted below under the green peppers and good as snacks, pickles, salads, cracker substitute and I could go on. Cucumbers are a staple on our grocery list and it’s nice to have three more to add to the fridge! We had one for lunch, so only two left for the rest of the week! I’m hoping my plants produce a few this week too… we will see! Green peppers: As I was looking around for some recipes to share in this email I found one of my favorite summer salads and I decided to save it for last! So if you made it to the end of the email, congrats and I hope this recipe made it all worth it! Another benefit is it uses a lot of the veggies we got this week: cabbage, peppers, cucumber, tomatoes and it takes a few other ingredients. This is my Summer Cabbage Salad. It’s good on the first day, better on the second and perfected on the third day as the flavors meld and it marinates in the dressing! 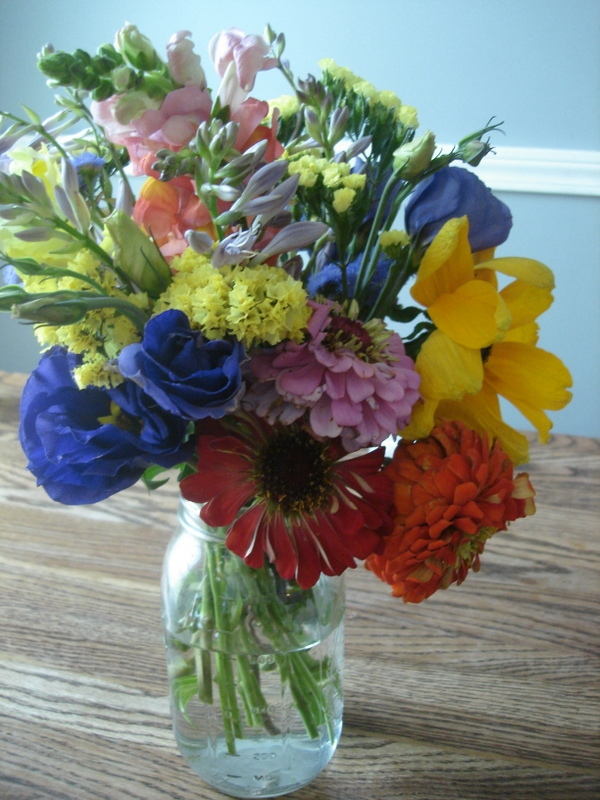 Enjoy your veggies… and flowers!